The championship is accelerating following two nail-biting competitions in Miami Beach and Mexico City as teams chase points and prize money around the globe. The ranking battle has intensified, with Monaco Aces the new leaders, just one point ahead of Shanghai Swans, who in turn are one point ahead of Miami Beach winners Valkenswaard United. Miami Glory and Antwerp Diamonds are currently tied in fourth, just a further point away from the top three. As the Championship heads to Antwerp for the first European leg, the stakes are raised for all the teams as the momentum of the new format builds. Thousands of fans turned out for the new GCL team competition adding to the already colourful and exciting atmosphere at the show ground. The high-energy signature music of the teams, including tracks by Calvin Harris, Rihanna and Bruno Mars and theme music from Star Wars and 007, elevated the energy in the big arena. Javier Salvador, co-owner and manager of current GCL leaders Monaco Aces, said: "This is amazing for the sport and it is great to be part of a team and involved. It's having a huge impact on social media." Excited fans queued for autographs from the team riders and easily identified with the colourful polo shirts emblazoned with team names and logos. 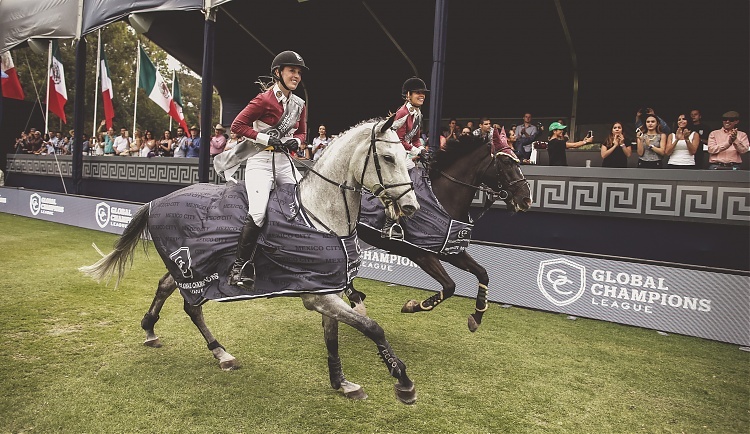 In true Mexican style, the Global Champions League Teams were greeted with a boisterous welcome as they walked the course in preparation for the first round of the second leg of this revolutionary new team competition. It was a test until the last rail, but it was the graceful pair of Edwina Tops-Alexander (AUS) with the 12 year old gelding Ego van Orti and Janne-Friederike Meyer (GER) with the grey 11 year old mare Charlotta representing Shanghai Swans who finished with best score of the day. Donning their custom polo shirts, twelve teams of two walked, planned and practiced together as well as rooted for one another as they took on the challenges of the courses. Set at 1.55m, the first round included fifteen efforts that proved to be a true test for the top riders. Difficult lines and light jumps caused rails and a couple of eliminations. Five of twenty-four riders did negotiate the track without fault, but no teams went into the second round with a zero score. During half-time, between rounds, the entertainment was as fabulous as the competition, with the dynamic Raiz de Mexico Mariachi band and Ballet Folklorico Mexicano Adelitas dancers adding a unique and colorful flair. As the top eight scoring teams walked the second round, the buzz from the crowd continued to build. Once again the grandstands, sidelines and VIP were filled with adoring fans and supporters who were thrilled to see the world's best in equestrian sport. Eight teams would go through to round two. Shanghai Swans and Doha Fursan Qatar with team members Bassem Hassan Mohammed (QAT) with Argelith Squid and Sheikh Ali Bin Khalid Al Thani (QAT) on the experienced Imperio Egipcio Milton, were tied at four faults each and at the top of the scoring board so far. Sitting in third were Cannes Stars, with Kevin Jochems (NED) and Zanzibar, and Roger-Yves Bost (FRA) on the chestnut 10 year old stallion Farfelu de la Pomme, representing the blue and white team. Jumping clear was only part of the test in the second round of twelve efforts, in order not to accrue time faults the riders were required to keep up a solid gallop and stick to a tidy track. Eight of the sixteen riders who returned finished with time faults, three with only those time faults added. Tops-Alexander and Laura Renwick (GBR) finished with just one time fault each, and Roger-Yves Bost with two, adding those points to their total. Four riders rode without fault in the second round - Gonzolo Anon Suarez representing Madrid in Motion rode a sensational round on a horse he had never competed on before. Maikel van dar Vleuten (NED) of Monaco Aces, Mohammed for Doha Fursan Qatar and Harrie Smolders with the impressively consistent grey gelding Bokai for Antwerp Diamonds also jumped clear. The pairing have been the most consistent, and potentially valuable, on the League so far; jumping every round clear and recording the best results for the team. However clean rounds are only half of the equation, as the both team members scores are added together, which means every time fault and every rail counts. ​Ultimately, the Shanghai Swans topped the field with a final two round score of 10, earning a prize of 60,583 euros. Earning an impressive second place were Roger-Yves Bost (FRA) and Kevin Jochems (NED) of Cannes Stars. Making a name for himself as another twenty-year-old one to watch, Jochems was clean in round one and scored five faults in round two. Yves-Bost added 10 to the total, with a final score of 15. Jochems is thrilled to have an opportunity to compete at this level and be a part of the GCL. “It’s a great opportunity, I’m only 20 years old and it’s very special to be part of the team - many people my age cannot be part of those spectacular shows. The League now heads to Europe and Antwerp, Belgium, for the third round of competition as the 2016 Championship battle continues.